To avoid the problems of mechanical relays, Solid State Relay Interfacing are used. In this triac is used as a switching element and isolation is provided by opto isolators or pulse transformer. The Fig. 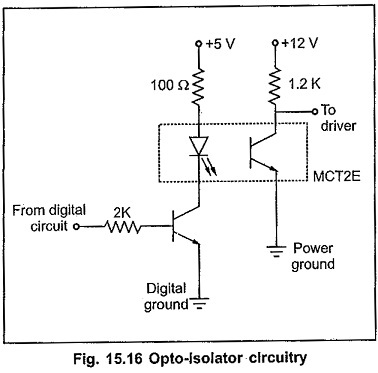 15.16 shows the typical opto isolator circuitry. It consists of LED and a photo transistor. LED glows when digital input is high, making phototransistor ON. Thus digital input controls the voltage at the collector of phototransistor without any physical connection between them, providing isolation. When digital input is low, LED and hence phototransistor is OFF. The Fig. 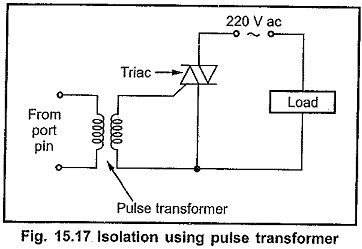 15.17 shows the typical pulse transformer circuit. The pulse transformer magnetically couples the control and power circuitry avoiding electrical contact between them. The opto isolator circuits give better performance at relatively low switching speed. Because it has switching speed limitations. On the other hand, at high switching speeds pulse transformer provides better performance. At low switching speed pulse transformer may get saturated to detonate its performance. One way to, increase current sinking and sourcing capacity is to use integrated circuit buffers such as 7406 hex inverting buffer and 7407 hex noninverting buffer. These buffers are of open collector type, therefore their current sourcing capacity is decided by external register. These buffers can sink current as much as 40 mA. This current is sufficient to interface LED displays.